When the handler called her name and led her out of the van, Daisy was trembling. A sweet furry puppy, we all wanted to pet and snuggle her, but she didn’t want to get out of that van. It was very cold here in New England, quite a change from North Carolina. And what a big change for this little puppy that had been born and lived her life so far in a shelter full of other dogs. We had to carry her to the car where she rode in the back seat next to Koa. Koa, delighted, was her most gentle and loving self. Now that we’re dog owners again, we’re noticing all the other dogs and their owners, getting tips from our dog-owner friends, and will have a consultation with a dog trainer recommended by our new vet. Daisy is happily chewing on rawhide bones and toys (as well as a few other things,) chasing balls, and enthusiastically wagging her tail for all the petting and snuggling we can give her. Fifteen years ago I said, “no more dogs.” This was after our old sweet cocker had died and we were tired of dog care. No more, I said. No more cleaning up the poop, no more rushing home to let her out or taking her to the vet or having to find care for her every time we traveled. Yay! We were free. But, as happens from time to time, our life changed. Now Jess is an artist and home full time, I’m at home part time, and we have a seven year-old granddaughter who is with us often and REALLY WANTS A DOG! And I began to think how nice it would be for Jess to have a canine companion. He didn’t like the idea at first. Like me, he’s grown accustomed to a quiet house, peace, serenity, freedom to travel. But, funny thing, whenever he gets within the vicinity of a dog, Jess goes all cuddly and playful and starts to talk dog talk. It didn’t take too much convincing. For weeks Koa has been bringing us dog books. Books on spaniels, books on beagles, books on terriers, and so on. She’s in the “which do you like better?” stage. Which do you like better: the terrier or the beagle? The Labrador or the Boxer? And she won’t accept a neutral “I like them both” answer. You HAVE TO PICK one, Nanny. This week we adopted a dog. We haven’t seen her yet, but we (Jess and I, daughter Shanti and Koa) are eagerly awaiting her arrival from North Carolina. 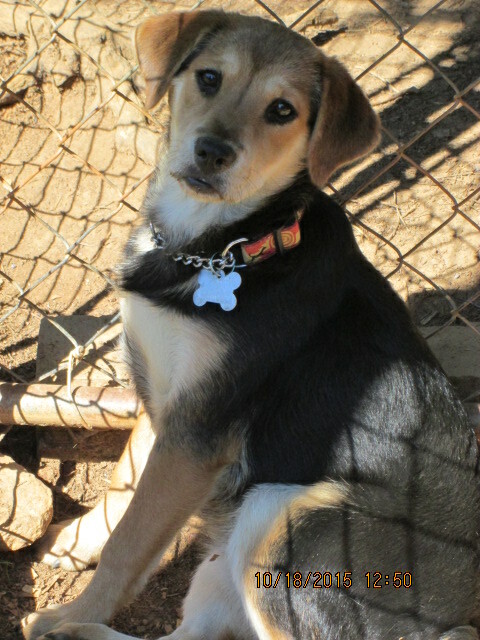 Daisy is five months old, part beagle, part retriever, and she’s been living in a rescue home. Fifteen years ago I didn’t know what a rescue dog was. Did we even have that term? Now, I’ve learned, there are over 14,000 rescue shelters and thousands upon thousands of dogs without homes in the United States. In places like the Carolinas and Tennessee, where dogs can survive if left to roam, people bring in strays, both adults and litters of puppies that get abandoned. The dedicated people who run the agencies give them food and shelter and medical treatment and have to find homes for them. In the past two weeks I’ve talked with Denise on the phone and over email at least seven or eight times. Denise runs the rescue operation, Howlin’4Spirit (What a name. Is this place for real? I thought at first,) in Rutherfordton, North Carolina. But it’s obvious that Denise could not be more committed to finding homes for the dogs she shelters. “This is my mission,” she said. I’ve filled out a bunch of forms, provided references, pet history, personal history, vet records for previous animals, and so on. Whew. This was something you didn’t do fifteen years ago. Maybe it’s a bit excessive, but how lucky we are to have these people who are so devoted to finding good homes for the animals. Now Jess is taking books out of the library: Dog Sense, Smarter Than You Think, Head of the Class, we’re discussing them at meals, and we’re watching Cesar Millan, the dog whisperer. This entry was posted in Uncategorized on November 8, 2015 by nancyhkilgore.